Need a meal prep idea for this week? 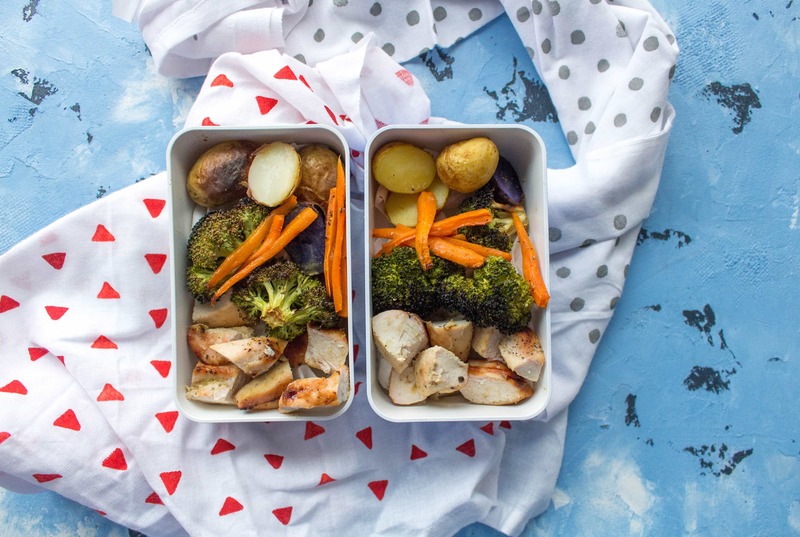 Why not try this delicious one sheet pan honey mustard chicken and veggies! It’s simple, delicious, and fast to make! Video recipe at the bottom! I hate washing dishes – there are days where I’m meal prepping and I’m like HOW DID I USE 10 BOWLS AND ALL THESE POTS?! WHAT WAS I DOING?! Not wanting to deal with dishes, I’ve been making more one pot/one sheet pan dishes and I’ve been loving not having to wash a zillion dishes. This week I wanted something a little different than my regular plain-ish oven baked chicken but didn’t want to do more work than necessary (aka dishes). Checking my fridge, I saw that I still had some mustard left and just rolled with it. Ideally, if I was to add a “sauce” like my honey mustard mix, I’d marinate it the night before so it would be more flavourful but I went with the “hm what’s in my fridge today” path. Next time! 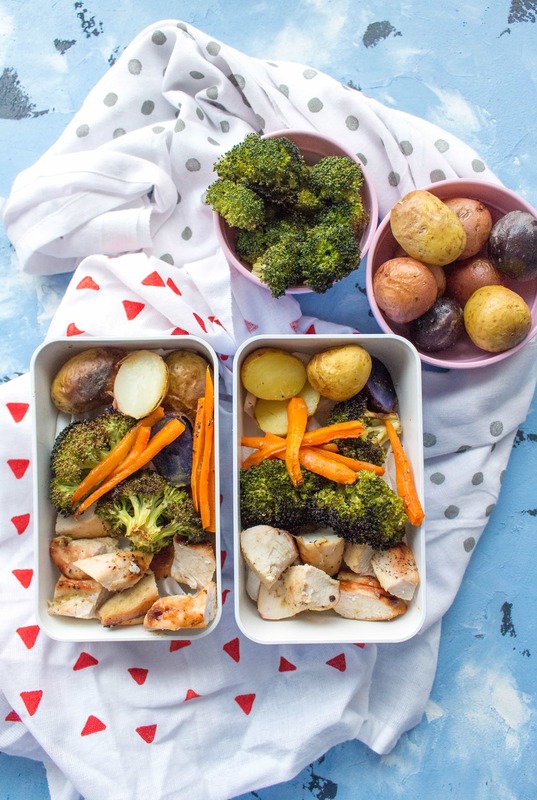 Instead of making rice for this One Sheet Pan Honey Mustard Chicken, I grabbed a mix of baby potatoes for my carbs (and it fit onto the pan so I didn’t have to cook rice separately!). And because I’m pretty boring, I went with broccoli and carrots for my veggies. I’m definitely going to have to step out of that comfort zone soon because I can’t just survive off broccoli and carrots for forever. Maybe next time I’ll try some squash! Is squash in season? I swear I had some just last week. I’ll have to check the market for it! Need a meal prep idea for this week? 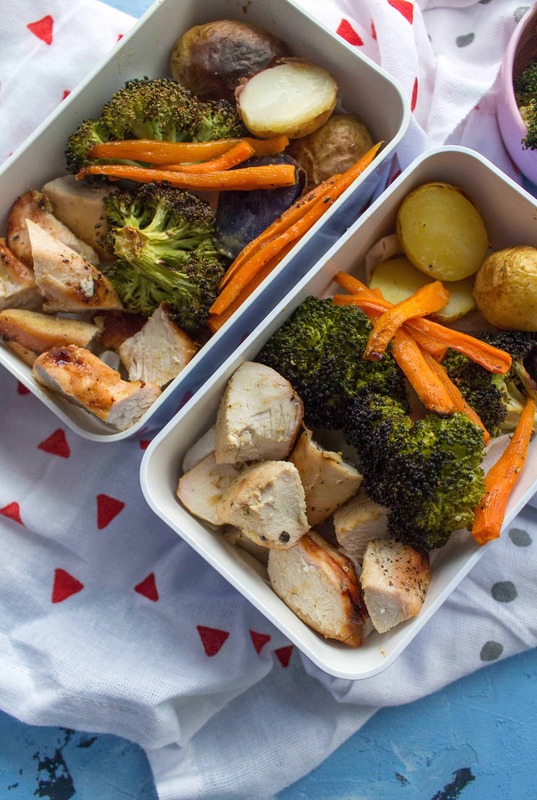 Why not try this delicious one sheet pan honey mustard chicken and veggies! It's simple, delicious, and fast to make! Mix together your sauce (honey, mustard, garlic powder, black pepper). Place the chicken onto the sheet pan with the veggies (lightly coated with butter/salt/pepper). Bake for 30 minutes. Or bake for 25 minutes then broil for 5 for a darker finish on the chicken. Let’s Chat! What’s your favourite veggie to meal prep?? Love a one pan meal! Very little dishes required is my kind of meal. This is my type of meal! Love one pan dinners! 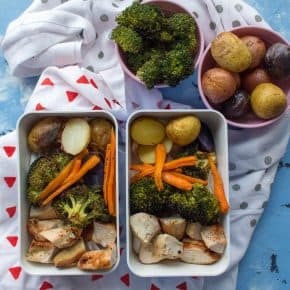 Sheet pan meals are my favorite way to meal prep – especially when they include lots of veggies! And who doesn’t love honey mustard chicken? YUM! This sounds great. I will try this recipe. I am sure my hubby will love this. Love this easy meal prep idea, and also love all the tasty ingredients! I love a good sheet pan dinner! These potatoes look especially delicious. I too am a fan of easy cooking meals. Will try your style of honey mustard sauce.